We’d love your help. 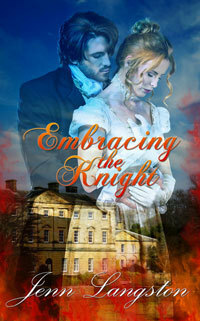 Let us know what’s wrong with this preview of Embracing the Knight by Jenn Langston. For y Miss Claire Ashford knows exactly what she wants out of life — to marry for love. When she finds herself alone in the woods with none other than notorious rake Ian Michael Caldwell, Viscount Knightly, her chances of a proper match are ruined. He is willing to sacrifice himself for the sake of her reputation, but she is determined not to marry anyone out of obligation. To ask other readers questions about Embracing the Knight, please sign up. What a farago. I got up to chapter 3 before I couldn't take any more of this nonsense. A woman 'diving' into a stream?? Give me a break. A stream, by its very nature, is small - you can paddle in it usually, or lie down in it at a pinch though the bottom is quite often rocky, but no way you can 'dive' into it even when it is flooded and then there is NO WAY ON EARTH you should be even trying to step into it. But there, she is, naked ( of course) having stripped off before 'she dove into the clear water' and now washing her hair in said stream and thinking lustful thoughts about her sensual male companion who s likewise stripping off to show his manly torso (of course). What a couple of plonkers. There was no sensible reason given for the two of them to be walking back to London through the woods. It was just .... stupid. The snake bite was the final straw f0r me. Right off the bat, the prologue gives superb context for the story and created a desire in the reader to see each of the group of boys do well in their lives. "Touched by Fire" makes sense in a very literal way, as each of the boys was affected by the fire the experienced. But also in a more subtle way, in that this experience was hellish for them all, and once you've been touched by hell, you're never quite the same. Each of the boys was affected in a different manner, in a different part of th Right off the bat, the prologue gives superb context for the story and created a desire in the reader to see each of the group of boys do well in their lives. "Touched by Fire" makes sense in a very literal way, as each of the boys was affected by the fire the experienced. But also in a more subtle way, in that this experience was hellish for them all, and once you've been touched by hell, you're never quite the same. Each of the boys was affected in a different manner, in a different part of themselves. Jumping forward in their lives, the reader is introduced to an adult Ian and Claire. As children, their lives had intertwined as children's are whose siblings are friends. In this case, it was Claire's brother who was friends with Ian, and she was the quintessential "tag-along." In their present day, Claire harbors a great deal of hurt feelings toward Ian, who she had always secretly had a crush on. Something had happened in their childhood that caused him to suddenly change. Coming back from a pleasant afternoon picnic, Ian and Claire - who are only sharing a carriage due to a last-minute change by her friend - are waylaid by highwaymen who rob them and leave them stranded. Having learned harsh lessons early in his life, Ian refuses to be daunted by a walk through the woods. At least not for himself. He is, however, very upset at this unpleasant turn of events for Claire. After all, he has long dreamed of marrying her, and seeing her scared, stressed, and miserable is the last thing he wants. Ian's dedication to Claire and desire to see her happy and safe is truly heartwarming. He is a good man. Somehow, though he has clearly earned her ire, and he's really not sure how. The mystery of how these two can care so much about each other and yet keep slipping through each other's fingers makes for a charming and delightful read. My favorite part of the story is the ending. I love how things work out and the attention to detail, remembering special moments, and celebrating love. It was a lovely read that made me excited to read the rest of the series. It was hard to finish this book. It was not coherent nor was it fluid. I felt like it was jumping all over the place. So were the two main characters. There was too much push and pull between them. While resistance and some conflict are always expected, there were too many instances in the story that I wanted to whack them upside the head and tell them to make up their minds. Maybe the story would have been better if it was shorter as that kind of conflict can only be used for so long in one sto It was hard to finish this book. It was not coherent nor was it fluid. I felt like it was jumping all over the place. So were the two main characters. There was too much push and pull between them. While resistance and some conflict are always expected, there were too many instances in the story that I wanted to whack them upside the head and tell them to make up their minds. Maybe the story would have been better if it was shorter as that kind of conflict can only be used for so long in one story. Extremely frustrating. JUST TELL HER YOU LOVE HER ALREADY. This whole thing could have been wrapped up in half the time, at least. I really want to know what happens in the next book with Gordon and Annalise but I don’t know if I can put myself through the pain of it. If there’s a constant push and pull the ENTIRE BOOK like this one, I’ll lose my mind. I enjoyed this book & the characters were great. The lack of communication drove me crazy at times but the book would not have worked if they did communicate! I highly recommend this read & am looking forward to the next book in the series. Though it started with a bang after 3 hrs in I just couldn't get into it...no action and just some talk about reputations. This book is an average story. It became too mundane and repetitive with Claire leading Ian on and then turning him down. It should be shorter which would make it a better read. Thank you for these wonderful romance series. Please keep writing more of these wonderful books. Thank you very much for these books. I listened to the audiobook of this and it was fabulous!! The narrators were amazing, English accents and all! This is a great book. I enjoyed the historical aspect of the era. It was a fast read. I will be reading more in the future. This book was literally everything I look for in this genre. Hearts in my eyes. I usually love Jenn Langston but this book just seemed really rushed and half hearted. I didn't believe the love between the hero and heroine, it just didn't seem to appear. As for the complete disregard for behaviour during the mourning period, it was just not at all consistent with this era. All in all, a complete dissapointment. This is the story of 3 childhood friends, Ian Caldwell, Marcus Hera and Gordon Ashford (Ian's best friend). The three of them were together in fun times as well as not so fun. An accident in their youth left the three of them scarred for life. Now fast forward a few years, Ian now called Lord Knightly reconnects with Claire Ashford. Ian had had feelings for Claire as children but never thought to act on any of his feelings because of his best friend, her brother. Claire had also hid her crush on Ian from everyone, Ian was a womaniser she had no intention of becoming another of his conquests. I really do not like giving spoilers for any books so I guess I should end here before I give things away. Actually this is the first book I have read from Jenn Langston but it will definitely not be my last. If you enjoy a nice historical type of romance, you should give her a try. She lives in the beloved state of Texas where she was born and raised. With her husband, three beautiful children, and three cats, she has a full house. There is never a dull moment, but always Jenn Langston is a writer and a lover of historical romances. She developed her love of reading romance novels at a very young age. What began as the simple joy of reading developed into a passion to write.